Again, thank you for being a Shape Me member. Also, Thanks for helping to recruit some new members in 2016. 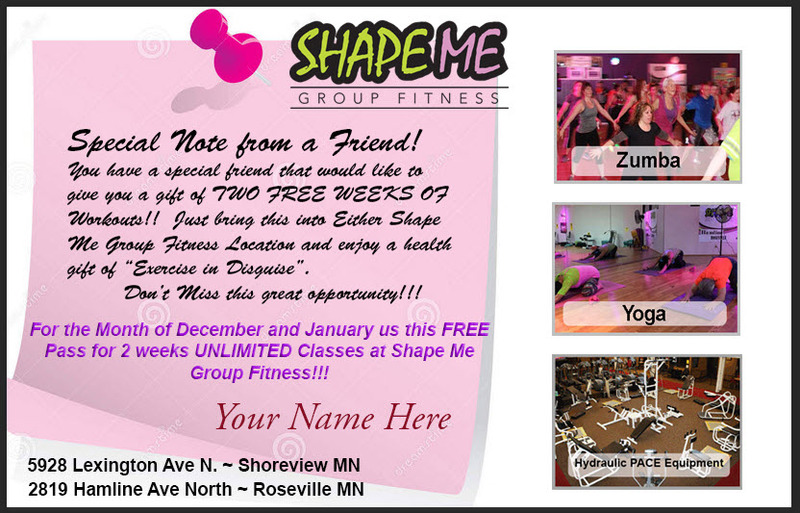 For your Friend: For your friend we are offering a very special 2 week unlimited trial membership to either of the Shape Me facilities. What this means to you: From now until the end of February we are going to double the rewards for the “Refer a Friend program”!! If you are an Unlimited Member and you refer/recruit a new member that purchases an unlimited Membership to Shape Me Group Fitness, we will credit your account with 2 months of free membership. Or if you “Refer a Friend” and they prefer to purchase a Punch Card we will credit your account $10. If you are a Silver&Fit member and you refer/recruit a new member that purchases an unlimited Membership to Shape Me Group Fitness, we will offer you a $20 credit to your account or if you prefer a $10 for a punch card. If the referral/recruit prefers to purchase a Silver&Fit membership we will credit you 50% of the revenue for the first month to your account. First, we have created a special invitation card that you can print and send, or you can click on the "Click Here to tell us who you want to invite" link and fill in the name and information. We will then take care of it in a very discreet way. Click Here to tell us who you want to invite! You may also invite them to the NEW and IMPROVED 8-Week Challenge. Don't forget to sign up for this for yourself. If you are interested in a great weight loss options please come in when we are open. Someone will be at the front desk!! If you have another idea please call or text Ritzy at 651-214-2299, or Gary at 612-916-2006. We appreciate your business and any help you wish to provide in helping grow the Shape Me Group Fitness Studios.